On January 16, two Sengwer herders were shot by Kenya Forest Service guards implementing an EU-funded development project – the Water Towers Protection and Climate Change Mitigation and Adaptation (WaTER) Project. What UN experts have called “repeated attacks and forced evictions by agents of the Kenya Forest Service” is part of a longstanding campaign to forcibly evict the Sengwer from their forest homes, rather than supporting community land management programs which would protect the forest and the rights of indigenous forest communities. Sengwer women have especially suffered as they are violently evicted from their forest homes and separated from the traditional foods, medicines, and cultural resources they rely on to provide for their families. 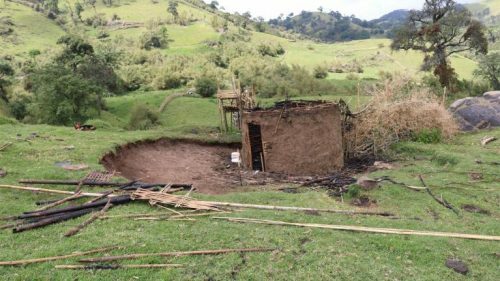 Between 2007 and 2013, after receiving funds from the World Bank to implement a natural resources management project, Kenya Forest Service guards carried out a series of attacks on the Sengwer, arresting community members, burning their homes and destroying their property. The World Bank’s independent accountability mechanism found that the Bank should have anticipated the risk of violent evictions given KFS’ practices. Despite this history, in June of 2016, the European Union approved funding to KFS to implement the Water Towers Protection and Climate Change Mitigation and Adaptation (WaTER) project within Sengwer territory in the Cherangany Hills and Ogiek territory at Mt Elgon. On Christmas day, 2017, 100+ armed Forest Service guards entered the lands of the Sengwer, and in the days following they fired gunshots, burned at least 15 homes, and killed the communities’ livestock. Then again on New Year’s Eve, KFS guards went house to house searching for community leaders, using live bullets to intimidate community members, and setting fire to more homes. Despite repeated warnings of the escalating human rights risks, and calls for action, the EU has failed to ensure that the Sengwer and Ogiek people’s rights are protected. The EU announced January 17 a suspension of support for the project. This move is welcome, however, it is only the first step, as Sengwer homes continue to be burned. The Sengwer and Ogiek are calling for an urgent expert meeting to establish a clear roadmap to change Kenyan government agencies’ violent approach to forest management to a rights-based approach that works together with the Ogiek and Sengwer to protect the forest. If the safety and human rights of the Ogiek and Sengwer peoples cannot be immediately guaranteed, the EU must stop its support for the WaTER project. Please share this ACTION ALERT to urge the EU to take immediate action to guarantee the safety and human rights of Kenya’s Sengwer and Ogiek people and a rights-based approach to conservation. You can find more information and videos here: http://www.forestpeoples.org.